Almost every evening around ten o’clock, I am drawn downstairs from the family room to our kitchen with a gnawing craving for a peanut butter and jelly sandwich. This is one of my favorite moments of the day. Waiting there in the pantry, simply for my indulgence, is a homemade loaf of bread, a jar of peanut butter, a little bear-shaped squeeze-bottle full of honey, and a bag of potato chips. The other necessities await me in the fridge: an ice-cold carton of milk and cherry jelly. Most evenings this ritual plays out perfectly, except for those rare, sad times when some key ingredient is missing. I can live without the chips or the honey, but every so often there is no milk, or we are low on peanut butter, and my hopes for the perfect PB&J vanish. Some ingredients are simply necessary. This is one reason why I find cooking shows to be an exercise in frustration. When these chef-gurus prance out into their professional kitchens—the kind missing the one wall where the TV cameras go—all the latest high-end culinary equipment is at their disposal. They know things about preparing food that we mortals cannot grasp. Worst of all, they regularly cook with ingredients that have never once been on any shelf in my local supermarket. What is the point of showing people how to cook with ingredients they don’t have? Without the right ingredients, everyone knows that a recipe is useless. Tell you what, let’s go to the supermarket—a really nice one. It’s a supermarket of biblical truth. As we stroll the aisles and review the wares, you are probably going to feel overwhelmed. There is so much your children need to be taught! That’s OK. Embrace that feeling. Your sense of helplessness will push you to rely on the grace of God as you take the exciting journey of family discipleship. Perhaps your children are not exactly children anymore. 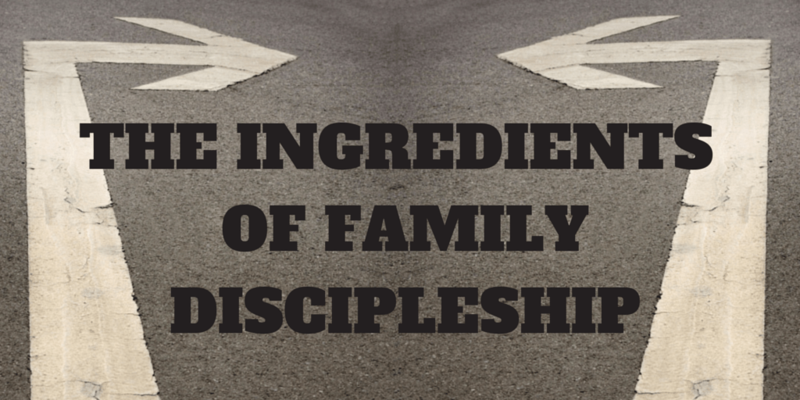 If so, remember that your call to family discipleship only ends when you die. You have a lifetime to cultivate truth in the hearts of your children. Even when they are adults with their own families, you should lovingly and prayerfully encourage your children in their walk with Jesus. The nature of the parental role changes as our children mature, but its essence does not, and we are called to steward faithfully all the days the Lord has entrusted to us. Yes, it’s a formidable list. Yet it helps create a manageable structure, ways of thinking about how and what you ought to pass along to your children. In fact, if you will commit to learn from each of these seven categories, you will have all the right ingredients at your fingertips for a lifetime of fruitful learning and teaching.